I am sad to say today we mourn the passing of a beloved old friend by the name of Common Sense who has been with us for many, many years. No one knows with any certainty how old Common Sense was since the birth records were lost millenniums ago in bureaucratic red tape. Common Sense will be remembered as having cultivated such valued lessons as knowing when to come in out of the rain, why the early bird gets the worm and that life is not always fair. Common Sense lived by simple, sound financial policies (don’t spend more than you earn) and reliable parenting strategies (adults, not kids, are in charge). His health began to rapidly deteriorate when well-intentioned, yet overbearing regulations were set in place. Events such as reports of a six-year-old boy charged with sexual harassment for kissing a classmate, teens suspended from school for using mouthwash after lunch, and a teacher fired for reprimanding an unruly student only worsened his condition. His health declined even further when schools were required to get parental consent to administer aspirin to a student, yet could not inform the parents when a student became pregnant and wanted to have an abortion. Ultimately, Common Sense lost the will to live as the Ten Commandments were pronounced contraband, churches became businesses, and criminals received better treatment than their victims. Common Sense finally lost the will to live after a woman failed to realize that a steaming cup of coffee was hot, spilled a bit in her lap, and was awarded a huge settlement. It is worthy to note that Common Sense was preceded in death by his parents, Truth and Trust, his wife, Discretion; his daughter, Responsibility; and his son, Reason. He is survived by two stepbrothers-- My Rights and Ima Whiner. Not many attended his funeral since so few realized he had passed away. If you are still in touch with him, pass this on, if not you can provide him a second passing. Only old-timers, the like of me, will know how true and sad it is. Young people of today will likely write it off as an oddity. Still, I am sending a copy to my friends and relatives in hope that they will retain at least some of the truth and good judgment. 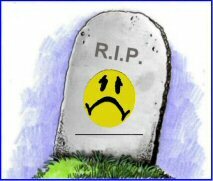 May I please have permission to use the Common Sense obituary in Integrity Talk, the official Journal for the International Association of Ethics Trainers.